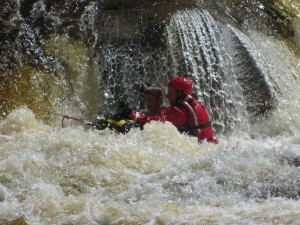 The quick response of Conway’s Swift River Rescue Team saved the life of a 14-year-old boy Monday Morning. According to Conway Fire department at 11am Monday crews responded to call that a boy who had been playing in the Swift River with his brother when he lost his footing and was swept down river. 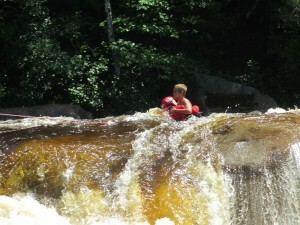 Luckily he was able to but was able to cling to rock just feet from the Lower Falls. The rain the night before resulted in the river running high and there was real danger that if the victim went over the falls he would be swept downstream faster then rescuers could move along the shore to get him. Time was of the essence because it looked like the boy couldn’t hold out much longer so rescue crews performed a high-risk rescue. Conway Fire Chief Steven Solomon said that in ideal conditions they would set up a safety line across the river and then have a rescuer pull him from the river. However seeing that the boy was losing his endurance to hold onto the rock rabidly, they made the decision to perform a high risk rescue. Chief Somon himself, a rescue swimmer, was deployed and swam to the victim. 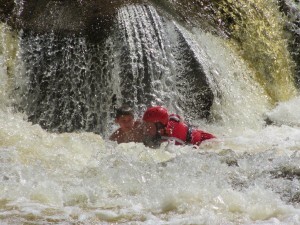 He then made a controlled decent over the falls with the victim where they were helped back to shore. The boy was a bit shaken up and cold but was uninjured. The Chief said that they would like to remind everyone to watch the weather conditions and remember that rain hours before will still be effecting the rivers. What is sometimes a peaceful and calm place to swim is other times a raging torrent.